Australian Shepherd Temperament: Are you Ready for a Canine Genius? The loyal and clever Australian Shepherd temperament makes this dog a fabulous ranch dog and a popular pet in American households. Australian Shepherds were the original companions of the cowboys. Many Aussies are still used as working dogs to this day. The breed is also gaining popularity as a family pet. However, potential owners need to be prepared to handle a herding dog with a lot of energy. The Australian Shepherd breed can be too difficult for novice owners. These dogs need a ton of exercise and mental enrichment. They also have a strong herding instinct that can go haywire without an appropriate outlet. Some unprepared owners find themselves with Aussies that obsessively try to herd cats, children, and other household pets. Australian Shepherds are beautiful, striking dogs, but do not be taken in by their stunning good looks. Make sure you do extensive research to make sure this dog will fit with your lifestyle before you bring one home. The ancestors of the modern Australian Shepherd dog originated in Europe. The Aussie forbearers traveled with immigrants to Australia and then on to America. The Australian Shepherd that we know today was truly created in America. Despite its name, the Australian Shepherd is considered an American breed. Australian Shepherds were an essential part of the founding and culture of the American West. The breed evolved into the rugged, intelligent, hard-working breed that we know and love today. The intelligent Australian Shepherd temperament makes this dog one of the smartest breeds in the canine world. Aussies are incredibly bright, focused, driven, and attuned to their owners. In fact, Australian Shepherd intelligence is almost legendary. There are countless tales of Aussies that have performed amazing feats of intelligence. Some owners feel like their dogs can practically read their minds. Because of their keen intelligence, Aussies get bored easily. It is vital to keep your Australian Shepherd mentally challenged. You can do this through obedience training and canine competitions such as agility. You can also give them food puzzles and other forms of mental enrichment such as Kongs and busy balls. Instead of feeding your Aussie his meals in a dog bowl, make him work for his food by feeding him from a Kong Wobble or a Tricky Treat Ball. Rotate his toys to keep him from getting bored with the same old items day after day. A bored Australian Shepherd will resort to creating his own fun through chewing, digging, barking, etc. Some Aussies will even develop compulsive behaviors if they are severely under stimulated. Make sure you can devote plenty of time on a daily basis to exercising your Aussie’s brain cells. Australian Shepherds have been bred for generations to possess a strong herding instinct. If an Australian Shepherd is deprived of cows or sheep, he will transfer that instinct to other objects. For example, Australian Shepherds living in urban settings are known to try to chase cars, bicycles and skateboards. This can be extremely dangerous if your Aussie darts into traffic. Make sure you keep your Australian Shepherd on a secure leash at all times unless you are in a safely fenced area. Vigorous exercise and mental enrichment will help diffuse some of these tendencies. If your Australian Shepherd develops compulsive chasing behavior, seek assistance from a veterinarian and a professional trainer. Aussies are sturdy, athletic dogs. They need a regular outlet for their energy. Be prepared to set aside at least an hour a day for exercising your Australian Shepherd. Vigorous exercise such as jogging, biking, or hiking is best. If you cannot budget that much time for physical exercise, consider adopting an older Australian Shepherd. Adult and senior Aussies still enjoy daily walks and playtime, but they do not need as much exercise as puppies and young dogs. You can also look into a doggie daycare or a dog walker to help meet your dog’s exercise needs. The active Australian Shepherd temperament makes this dog a great choice for young, outdoorsy owners. The naturally protective Australian Shepherd temperament makes this breed an excellent watchdog. Australian Shepherds were bred to not only herd their flocks of sheep but also to protect them against predators. The Australian Shepherd will usually transfer that protective instinct to his family. The good-natured Australian Shepherd temperament can make this breed a great companion for respectful children. Australian Shepherds love to romp and play with kids. It is important to supervise all interactions between children and dogs of any breed. Use treats to help your Aussie form a positive association with children. Due to their strong herding drive, Aussies will sometimes try to herd running children. For this reason, households with older kids or teens are better than homes with very young kids. Toddlers are too young to understand this behavior and it can frighten them. Whereas, older children have the maturity to understand that the pet is not trying to hurt them—just trying to keep them in line! With proper socialization, Australian Shepherds can usually adapt to multi-dog households. If you adopt your Aussie as a puppy, sign up for a puppy socialization class or puppy kindergarten class. If you adopt your Aussie as an older dog, you can still use positive reinforcement to acclimate him to other pets. Take the introductions slowly, and always separate the animals if you have to leave them unsupervised. With time and training, many Australian Shepherds can share their homes with cats. You will have to teach your Australian Shepherd that it not appropriate to herd or chase your cats. Praise your Aussie and give him rewards for calm behavior around the cats. If he tries to chase the cats, put him in a time out. Make sure the cats have a separate dog-proof room where they can eat and use their litter boxes in peace. It is also important to make sure the cats have tall perches throughout the house (like cat towers) where they can feel secure. Australian Shepherds are extremely focused, motivated and trainable. With the right guidance, training your Aussie will be a fun and rewarding experience. Sign up for an obedience class with a positive reinforcement trainer in your local area. Positive reinforcement is the most effective and humane method of training. Never use harsh “corrections” to train your Australian Shepherd. Do not work with any trainers that advocate dominance methods such as alpha rolls, pinch collars, choke chains or shock collars. These methods are unnecessary and will damage the trust between you and your dog. Australian Shepherds enjoy training and are eager to learn new things throughout their lives. Once you and your Aussie master the basics, you can take your skills to the next level with training for agility, nosework, Frisbee, search and rescue, and canine good citizen certification. For help with training your Austrailian Shepherd dog take a look at The Online Dog Trainer by Doggy Dan. Doggy Dan is an expert Dog Trainer based in New Zealand. His online resource contains Hundreds of Excellent Dog Training Videos that will take you step-by-step through the process of developing a healthy, happy well-behaved dog. Australian Shepherds can suffer from anxiety related behavior problems such as separation anxiety. Increasing mental enrichment and exercise will often help dogs cope with anxiety. You can also try calming chews and pheromone plug-ins such as Dog Appeasing Pheromone (DAP). If you notice any serious behavior issues, seek help right away from a professional positive reinforcement trainer. Some people may feel like there is a difference between male Australian Shepherd temperament and female Australian Shepherd temperament. However, most animal professionals feel that there are no major personality differences between the genders. When you are searching for your perfect pet, try to remain open to both genders. The Australian Shepherd is a medium-sized, stocky working dog. One of the most distinctive attributes is the Aussie’s bobbed tail. Most Aussies are born with naturally short tails, but sometimes the tails are docked at birth. The average Australian Shepherd weight is between 40 (female) and 65 (male) pounds. The average Australian Shepherd height is 18-21 inches for females and 20-23 inches for males. Australian Shepherd colors are beautiful and unique. Their color patterns are highly individual. A blue merle Australian Shepherd has a coat mottled with blue, tan, white and black. 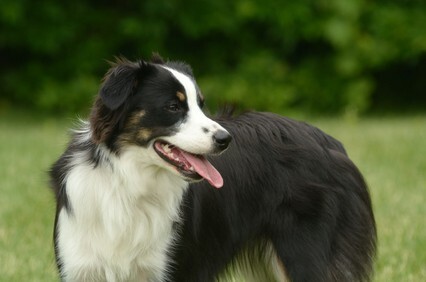 Likewise, a red merle Australian Shepherd has a coat pattern that is swirled with red, tan, white, and sometimes black. Aussies also come in a coloration called tricolor. They can also be solid black or solid red. However, Australian Shepherd Breeders should be discouraged from breeding double merle dogs. These Aussies are predominantly white and they are almost always deaf and/or blind. If an Australian Shepherd breeder breeds two merle dogs (blue merle or red merle), every puppy in the litter has a 25% chance of being homozygous merle (also called double merle or “lethal white”). Despite the risks, unscrupulous (or uneducated breeders) will still breed two merle dogs because they want to profit from the healthy puppies in the litter. Any puppies that are born homozygous merle will be culled at birth, sold to gullible buyers, or brought to animal shelters. There are rescue groups devoted solely to rescuing these special dogs from animal shelters and placing them in homes of experienced owners, but such homes are limited. The practice of breeding two merle dogs is irresponsible and should be condemned. Although the United Kennel Club has official policies to discourage this practice, the American Kennel Club does not. If you decide to purchase an Australian Shepherd puppy from a breeder, be sure to ask about this, and do not support any breeder that condones such irresponsible breeding practices. The beautiful Australian Shepherd coat requires frequent brushing and grooming. You will need to comb the fur daily to avoid mats and tangles. A professional haircut is needed about twice per year. The Australian Shepherd sheds throughout the year and the hair is not considered hypoallergenic. Therefore, if you have allergies or an aversion to dog fur, this may not be the right breed for you. A great resource for health information is the Australian Shepherd Health and Genetics Institute. Like all dogs, your Aussie should be on flea and heartworm prevention at all times. Spaying and neutering are highly recommended and responsible breeders will require their pups to be altered at the appropriate age. With excellent care, the Australian Shepherd lifespan is between 13 and 15 years. Once you decide that an Australian Shepherd is the right breed for you, take some time to research Australian Shepherd adoption and rescue. There are many Australian Shepherds in need of new and loving homes. Most of the Aussies that get surrendered to rescue groups and animal shelters find themselves there through no fault of their own. Sometimes buyers are not prepared to provide enough exercise and attention to this challenging breed. Sometimes owners must give up their dogs when they move or go through a personal crisis or financial trouble. Aussie Rescue and Placement Hotline is a great place to start your search for a new pet. 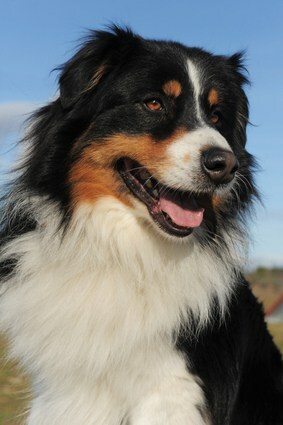 You can also visit Petfinder.com, Adoptapet.com and Getyourpet.com to find more Australian Shepherds for adoption. Make sure to visit your local animal shelter or humane society. Leave an application on file for any Australian Shepherds or Australian Shepherd mixes that arrive at the shelter. When you acquire your Aussie through a rescue group or animal shelter, the Australian Shepherd price is usually between $75 and $300 depending on the organization. Almost all rescued Aussies will come already spayed/neutered, vaccinated and vetted. If you decide to work with a breeder, the Australian Shepherd puppy price will be between $600 and $1000 depending on the breeder. Make sure to put in a lot of time and care when selecting a responsible breeder. Never simply order an Australian Shepherd puppy over the internet or purchase one from a pet store. Such puppies could come from backyard breeders or puppy mills. Contact the Australian Shepherd Club of America or the United States Australian Shepherd Association to get referrals of quality breeders in your area. Then set up a time to visit the breeder’s home in person. Make sure to meet the parents of the litter and view their medical records. Ask lots of questions about their health and temperaments. Do not be surprised if the breeder asks you many questions as well. A good breeder wants to make sure that all of their Australian Shepherd puppies end up in lifelong homes. Conclusion: Why the Australian Shepherd? The vibrant Australian Shepherd temperament makes this breed a favorite as a working dog as well as a pet for active families. Before you bring one home, make sure you can meet the needs of this athletic and intelligent breed. If you are looking for a loyal, quick-witted companion, the Australian Shepherd might be the perfect choice for you. Next post: The Border Terrier Temperament: Meet The Tough, Notorious Escape Artist!